Have you ever considered using your photographs as a fresh starting point, as a sort of pre-prepared canvas for further artistic expression? Art does not always have to start with a blank page or a totally original idea. You can take something you have already created (such as a photograph) and use it as the inspiration and foundation for another piece of art. I like to add nuance and depth to my photographs with the use of textures and the artistic tools offered in Photoshop. In so doing I usually come up with a piece that is so much more than the sum of the ingredients used - that suddenly becomes its own piece of artwork, separate from the original photograph. Even though the choices, manipulations and edits are made by me, the end result is frequently a surprise. I love the mystery of it all. Never quite knowing what the final result will be lures me into the process. I don't force myself to try and understand or interpret the meaning of my digital creations (which usually have an abstract quality to them), but I do archive them and often share them here. Perhaps one day, down the road, a compilation of the images will scream out the story of what my unconscious has been trying to say. For now, I am content to exercise my creativity with color, form and texture - using existing images and photos as my starting point. If you would like to do the same, allow me to offer you some textures recently made in the studio - for creative explorations that will take your images and photographs a step further. The application of textures invariably highlights things you did not even know were there, lying buried, waiting in the photo. Little gems of form, shade, dimensions sometimes subtle, sometimes bold, hiding in your photograph waiting for a platform, background or creative nudge to help it shine through. I know the textures created for you here will help you explore your own photographs as canvases for artistic expression, and hope you will give them a try. It takes time to make these textures. 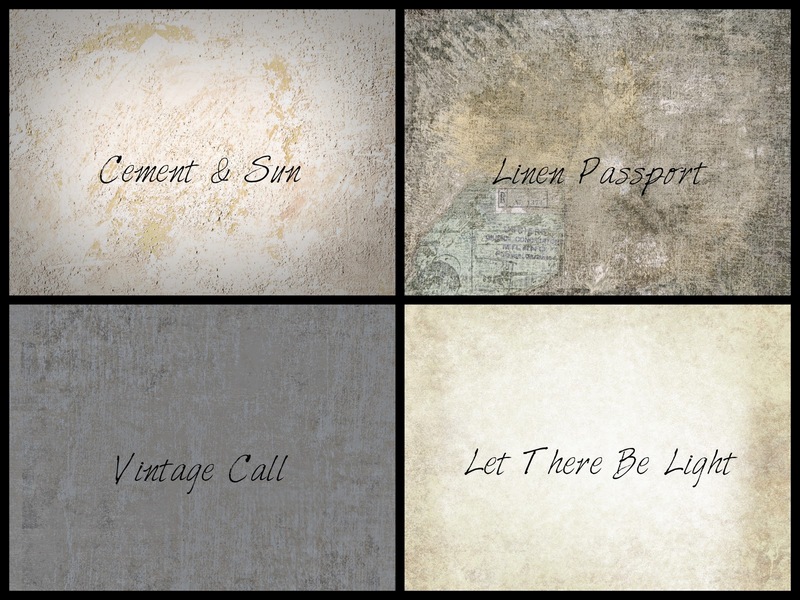 Some I make by painting them in the studio - Linen Passport and Cement and Sun were created with paint and textured mediums. Some I make using photographs and then tweaking them in Photoshop - Blue Shimmer was a photograph before it became a texture. Some I make starting with a blank file in Photoshop and using various tools to produce something that will add dimension and interest to a photograph. All the textures must then be tested on a variety of photographs to make sure they will add something of real value to a photograph. Those that do not are deleted. When the testing is complete, the textures must be packaged for viewing on the blog, compressed and uploaded to a file-hosting site that facilitates easy downloads. So while I will give textures away here on a weekly basis, because of all the time and effort involved, I will also package some of my best for sale at a nominal cost. Each texture set of four, seen above, can be yours for $5.00 USD. Purchase both sets, and they are yours for $8.00 USD. If you simply want to look at them here and get ideas for your artistic endeavors they are yours for free! :) I have set up The Studio Shoppe (see the new button under my header) where you can view and purchase these sets. You can also access The Studio Shoppe by simply clicking HERE. Linen Passport is really cool! I start my Kim Klassen class this March. I am really looking forward to it. Gorgeous Bonnie! I am finding as I clean in preparation for the spring flood that I see older photographs that I didn't care for, in a new appreciative way. The faded color and yellowish/brown tints are more appealing than I had once taken the time to truly admire. 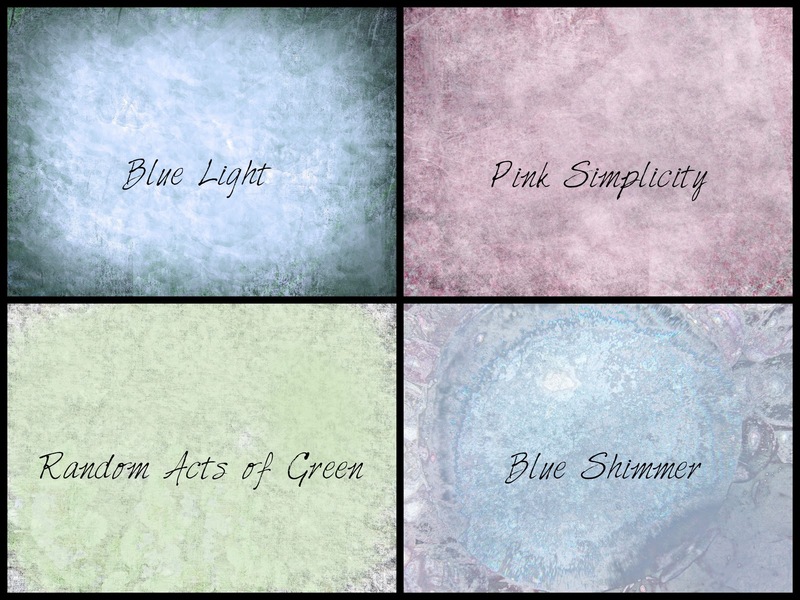 I love the softness and mystery of Blue Shimmer. Thank you Bonnie! These will be fun to play with. I love "Let there be Light."